Some shrubs never seem to have quite caught on and while forsythias are seen in every garden and are among the most popular of spring-flowering shrubs, if not THE most popular, the closely related abeliophyllum is rarely seen. The flowers betray the close reationship of the white or pale pink of Abeliophyllum distichum (the only species in the genus) to golden forsythias. 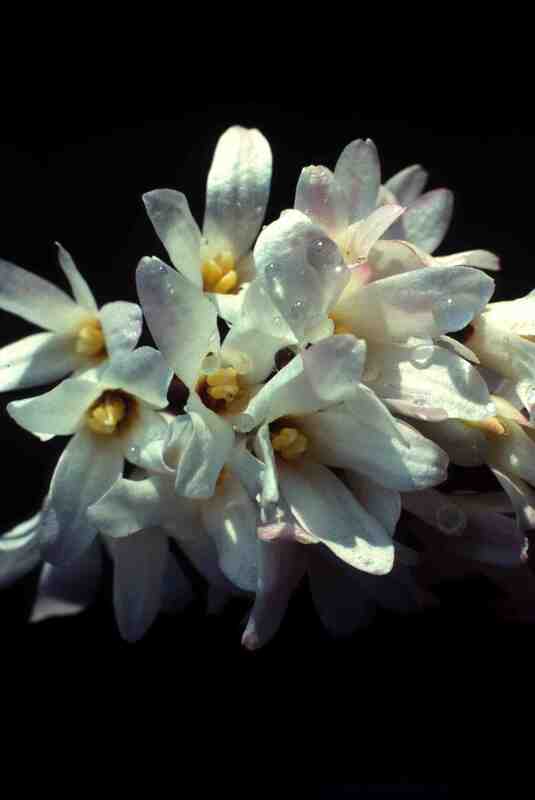 Abeliophyllum is from Korea and was introduced to the UK in 1924. It is a small shrub, reaching about 2m high against a wall – less in the open. It is absolutely hardy but the area it comes from has colder winters and hotter summers than most of the UK and that summer warmth is important to flowering. As a result is it best grown either in the east of the UK or grown against a sunny, south- or west-facing wall. The branches are not very long-lived and rather brittle so it should be pruned every few years, immediately after flowering. The leaves are small and very like forsythias and the flower buds, which are formed in late summer, are deep, chocolatey black in colour. The flowers have a slight fragrance and, in my opinion, the nicest plants, have pink flowers. It has thin, elegant growth, like a very refined forsythia and is a nice thing to have for early flowers and to provide a few stems for the house to go with snowdrops and daffodils. Does very well here in Iowa,USDA Zone 4.We have hot summers,and it has bloomed well even after -25 Fahrenheit winters.One of the earliest shrubs to bloom here.I tried Lonicera fragrantissima several times,but couldn’t survive the winter.